August 8th, 2007 - Made the guide. November 17th, 2007 - Updated with third upgrade. December 5th, 2007 - Updated with Gorgok as another farming spot. July 5th, 2008 - HUGE UPDATE! Updated with the latest Doom upgrades and purification. January 16th, 2009 - I changed the color of the headline from blue... to RED. Oh yeah. March 14th, 2009 - Fixed some stuff, and added some info about the soon-to-come upgrade. March 24th, 2009 - Added information about the latest Doom and Destiny upgrades, fixed a bunch of stat typos and other little things. September 25th, 2009 - Working on the Doom Knight section and will be adding it soon. December 15th, 2009 - Surprise my soons are AE-soons! Okay sorry for not updating. D: The Doom Knight section is up now, and I will be working on the new upgrades for the weapons these following days. December 16th, 2009 - Updated with the new upgrades and corrected some stuff, too. February 20th, 2010 - Updated with the new upgrade to the Destiny weapons and the new Destiny Blade. February 27th, 2010 - Changed STR to DEX on the daggers, and added a note about the first Doom upgrade. June 6th, 2010 - Removed note about the first Doom upgrade, added the levels for the Doom and Destiny weapons, added another location for Unlucky Doom Essences, and corrected some small mistakes. July 17th, 2010 - Updated some broken links. August 17th, 2010 - Updated with the latest Doom upgrades. January 13th, 2012 - Spooooooky Friday the 13th update! Not really, no new upgrades to the weapons. But it is Friday the 13th! And I haven't updated this for more than a year, so there. :P Just some touch ups here and there, biggest update being the removal of the recommended farming spots - there's a farming guide for that. :) Happy 2012 everyone! February 8th, 2012 - Slight update to the introduction, including a note about other items of doom. January 25th, 2013 - Blargh! Guide is being updated. Sorry for the delay. Happy 2013 everyone! Whoa this guide is old. January 31st, 2013 - Added a note about Blacksmithing for the Destiny weapons. July 19th, 2014 - Oh god this guide is almost seven years old. Where did the time go?! (/end existential crisis) Anyway, updated the guide to include the new Doom upgrades. June 12th, 2015 - No seriously, where DID the time go? Eight years and still going strong, baby! The guide has been updated. It is now up to date. 2.0 - The Doom Weapons - What? 2.1 - The Doom Weapons - Why? 2.2 - The Doom Weapons - How? 2.3 - The Doom Weapons - Where? Note: Sections tagged with [DA] mark content that is available only to Dragon Amulet holders. In Section 4.2, the [AQ] mark signifies that you may obtain a Blade of Destiny if you have AQ Guardianship. Tip: Use your web browser's find function (Ctrl+F) to quickly find your desired section. This guide will contain a vast amount of knowledge regarding the Doom and Destiny weapons - what are they, why get them, where to get them, how to get them, how to upgrade them - it's all here. 4. Necrotic Sword of Doom - Damage varies by level. 5. Necrotic Blade of Doom - This weapon is wielded by Sepulchure, the Doom Knight. It is unobtainable. The basic Doom weapons are all level 8, and they do not give any bonuses. The Necrotic Sword of Doom has multiple tiers, each with increasing damage and stat bonuses the higher the level. It is also listed as a scythe in-game, despite having the appearance of a sword - thus allowing all classes to wield it to the same effect. The Doom weapons also have a special attack, called "Doooooooom!". It has a 5% chance to trigger on basic attacks, making your weapon glow menacingly for the duration. 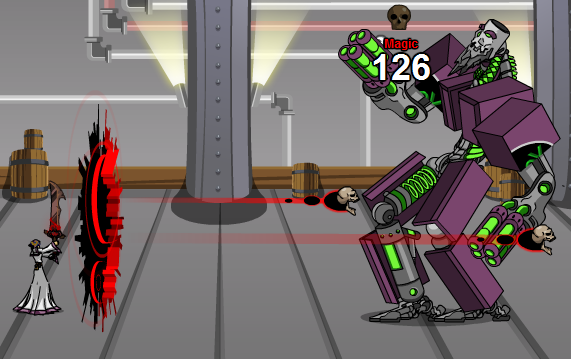 It is a Damage Over Time attack, meaning that your enemy will get hit by it for several turns, five in this case. If the opponent has any weakness to Darkness, the damage will be 10. The Destiny weapons have a similar attack, called "Face your Destiny!". It deals Light damage, and is identical to its Darkness counterpart. The Necrotic Sword of Doom has its own special attack - Doom Portal, which deals 12 hits of 100% Darkness damage. It is incredibly powerful, more so than the regular Doom weapons. (*) Note - These are the weapons considered main by the plot. There are other "items of Doom", as it were, such as the Doom Hammer and Cloak of Doom. So now you are probably asking yourself, how expensive are these weapons, really? The cost of purchasing a Doom weapon is 28,000 gold. You may think that that is a lot of money, but it really isn't that much. Gold will pile up at your feet while adventuring and playing the game, so there is really nothing to worry about. Now that you are satisfied and ready to take on the challenge, read on! You will need a starting sum of 28,000 gold to get your basic Doom weapon, and then another 28,000 gold if you also want a Destiny weapon! Now that's not a small amount by any account - which is why I recommend you take a look at Hopeful Guy's A Comprehensive Guide to Farming. Now that you have the gold, head left until you're outside of Falconreach's walls, then head up. Talk to the Mysterious Orb and prepare to part with your gold! Select the option "*Gulp* Shop", buy the Doom weapon that matches with your class and... congratulations! You now own a Doom weapon! Now go farm all over again so you can get a Destiny weapon. :P Onward to the next section, upgrading your Doom weapons! Hold tight, because this is a long one - time to upgrade your Doom weapon! The first upgrade is available to all, but the ones after that require a Dragon Amulet. Remember, you will have to upgrade your Doom weapon step by step, no skipping allowed! The first upgrade will require 5000 gold. You will need to purchase the Research Materials from Chaney's shop. Travel to Amityvale and talk to Thursday, the girl standing in the main area. Select 'Quests' > ' Crystal Clear Lake' and start the quest. At the first screen, kill the monster and go down. Second screen, kill the monster and this time go right. You will encounter more monsters, just keep going right until eventually you have a path up, and into the house. Inside the house, you will meet Chaney. Purchase the Research Materials from his shop for 5,000 gold, and then select 'Upgrade Doom Weapons' in order to merge the materials and your basic weapon to get the first upgrade. The Dark Doom weapons are level 8, deal 38-70 damage, and they now grant some Crit and the main stat of your class. Back in my day, the dark and wretched forces of nature had the decency to sell their wicked tools of damnation and agony face to face! Hmph. Anyway, the second upgrade will require you to get five Unlucky Doom Essences, which drop from the following quests: The Haunted Castle and AmityVillian. The essences also drop from various wars that occur periodically in the game, so keep your eyes open for those. When you're done, bring the essences and your Doom weapon to the Mysterious Orb, and select the option 'Upgrade Doom?'. After some talking, a merge shop will open. Merge the essences with your Doom weapon to increase its power. The Unlucky Doom weapons are level 12, deal 40-72 damage, and they now grant some Bonus while also lowering your LUK! The third upgrade requires a rank of 15 in Blacksmithing, your Unlucky Doom weapon, and eight Unlucky Doom Essences. Yulgar's Forge is located in Battleon Inn. In order to get there, you will have to go into Lim's shop in Falconreach, and select 'Crafting: Building Weapons' > 'Battleon', which will take you to Yulgar. The Mighty Doom weapons are level 15, deal 42-74 damage, and grant some more stats. The fourth upgrade. Yep! These next few upgrades will be found in Yulgar's Forge, so nothing new here. This time, a Blacksmithing rank of 18 is required and five Unlucky Doom Essences. The Dread Doom weapons are level 18, deal 45-79 damage, and grant some more stats. The fifth upgrade comes not only with improved damage and stat values, but also with a wicked new look! The required blacksmithing rank is still 18, like last time. This time you will need 13 Unlucky Doom Essences for the upgrade. Also, I just want to note that the weapons were available from a shop called Heartless, which opened up after the Friday the 13th Invasion of March, 2009 was won. They required the same amount of essences. Just a fun fact! The Heartless Doom weapons are level 24, deal 52-85 damage, and grant some more stats. The sixth and seventh upgrades are very small upgrades that came out together, so I decided to merge them into one section. The sixth and seventh upgrades will each require thirteen Unlucky Doom Essences. The Obsidian Doom weapons are level 27, deal 52-86 damage, and grant some more stats. The Forsaken Doom weapons are level 31, deal 53-87 damage, and grant some more stats. The eight and ninth upgrades, coming to a forge near us on a spooky Friday the 13th in August 2010. As per usual by now, you will need a blacksmithing rank of 18 and thirteen Unlucky Doom Essences for each upgrade. The Grim Doom weapons are level 35, deal 55-89 damage, and grant some more stats. The Dire Doom weapons are level 40, deal 57-91 damage, and grant some more stats. The tenth, eleventh, twelfth, and thirteenth upgrades! Boy these old weapons have come a long way, haven't they? This time, the upgrades are different - they can be found in the Shadow Doom shop, run by Ennwen in Braughlmurk Cape. These upgrades use a new material - Shadow Bone Shards, which can be acquired in the following quests: Braughlmurk Dungeon, Braughlmurk Sewers, and Haunted Forest. Each upgrade will require thirteen Shadow Bone Shards. The Bone Doom weapons are level 44, deal 57-91 damage, and grant some more stats. The Horrific Doom weapons are level 48, deal 61-95 damage, and they now grant Melee, Pierce, and Magic Def as well as some more stats! The Ghastly Doom weapons are level 52, deal 63-99 damage, and they now grant Block as well as some more stats! The Grisly Doom weapons are level 56, deal 65-101 damage, and grant some more stats. Moar! Moar upgrades! The fourteenth and fifteenth upgrades are here! These things just keep getting better huh? They even got a slight face lift this time around - looking all bloody and ominous! Anyway, you can find these upgrades in the Bloody Dooms shop, accessible by talking to Symone in Castle Valtrith. The Bloody Doom weapons are level 60, deal 67-103 damage, and they now grant Dodge as well as some more stats! The Sanguine Doom weapons are level 64, deal 69-105 damage, and they now grant Endurance as well as some more stats! Once again, a new material is required - the Primal Corrupt Essence, which can drop from the various quests in the event linked above. This time around you'll need 20. Fun! The Corrupt Doom weapons are level 66, deal 76-108 damage, and they now grant Parry, Wisdom, and Endurance, along with a reduction in Charisma! The weapons of Destiny are matching Light versions to their Doom counterparts - they are visually similar, one being the opposite of the other. They have the same DoT special attack as the Doom weapons (see section 2.0 - The Doom Weapons - What?) while being Light element. They match the Doom weapons in level and stats up to a certain level, after which they branch off with different stats and level requirements. The basic, level 8 weapons of Destiny are available to all players, but upgrading them is only possible if you are a Dragon Amulet holder. In order to get a Destiny weapon, you have two options: Either purify your Doom weapon to turn it into a Destiny weapon of a matching level, or buy a brand new Doom weapon and upgrade it all the way up from the most basic form. Now, purifying only works up to a certain tier - it is not possible to purify a Doom weapon higher than the Obsidian tier to the Destiny Pristine tier, since that option is simply not available in the game. I recommend you go with the second method, seeing as upgrading the Destiny weapons is a lot easier than upgrading the Doom weapons and then purifying them. Let's get down to business. You'll need to buy a brand new Doom weapon for 28,000 gold from the Mysterious Orb. After that, choose one of the methods listed above, and go on over to Artix, who is standing right at the entrance to the Necropolis. Get your very own Destiny weapon from the Purification and Upgrade shops, available once you complete the quests Artix has in store for you. Congratulations! You now have your very own Destiny weapon! If you're a Dragon Amulet holder, head on over to the next section. Time to upgrade! For both methods, you will need a certain amount of Undead Slayer Badges, much like the essences needed to upgrade the Doom weapons. You can find a list of drop locations in the Encyclopedia entry. In addition to the badges, you will need a rank of 15 or higher in Blacksmithing in order to upgrade your Destiny weapon to the Mighty tier, and a rank of 18 for the tiers afterwards. Requires your Doom weapon and ten Undead Slayer Badges. Dark/Unlucky/Mighty/Dread/Heartless/Obsidian Doom weapon + 10 Undead Slayer Badges = Shining/Lucky/Mighty/Guided/Brilliant/Pristine Destiny weapon. After reaching the Pristine tier, upgrades will be found in the Binding Destiny shop, run by Ennwen in Braughlmurk Cape. The upgrades will then require a certain amount of Braughlmurk Bindings, which can be found in the following quests: Braughlmurk Crypts, Brauglmurk Tower and Ship Graveyard. After reaching the Upright tier, upgrades will be found in the Righteous Destiny shop, available from Ash in the Serenity Before the Storm event from Friday the 13th, March 2015. The upgrades now require Pure Shards of the Dawn, which can drop from the various quests in the event linked above. After reaching the Wondrous tier, upgrades will be found in the Destiny Reforging shop, available from the challenge board at The Inn at the Edge of Time. The upgrades require a Royal Vault weapon V version from Are You Evil? quest to upgrade to the Imbued tier, Ultimate Flux to upgrade to the Penultimate Tier, and Elemental Dragon Badge to upgrade to the Ultimate tier. Ultimate Flux can be obtained by merging Elemental Flux that drops from the Siofra challenge, as well as Ultimate Blade Pieces that drop from the Theano challenge. Elemental Dragon Badge can be obtained by merging Elemental Vanquisher Badge that drops from the Elemental Chaos challenge, and Badge of the Dragon Vanquisher that drops from the Triple Trouble challenge. The Destiny weapons are level 8, deal 36-68 damage, and grant no stats except for the Destiny staff, which grants +1 to crit. The Shining Destiny weapons are level 10, deal 38-70 damage, and they now grant some crit as well as the main stat of your class. The Lucky Destiny weapons are level 12, deal 40-72 damage, and they now grant some LUK and Bonus as well as some more stats. The Mighty Destiny weapons are level 15, deal 42-74 damage, and grant some more stats. The Guided Destiny weapons are level 18, deal 45-79 damage, and grant some more stats. The Brilliant Destiny weapons are level 24, deal 52-85 damage, and grant some more stats. The Pristine Destiny weapons are level 28, deal 55-85 damage, with the axe and daggers now granting some END while the staff now grants some WIS in addition to some more stats. The Binding Destiny weapons are level 32, deal 57-87 damage, with the axe and daggers now granting some WIS while the staff now grants some END in addition to some more stats. The Pure Destiny weapons are level 36, deal 59-87 damage, and they now grant some CHA in addition to some more stats. The Key Destiny weapons are level 40, deal 61-89 damage, and they now grant some Parry and a +1 bonus to all stats! The Upright Destiny weapons are level 44, deal 61-91 damage, and grant some more stats. The Righteous Destiny weapons are level 47, deal 64-94 damage, and they now grant Block, Dodge, Crit, Wisdom, and Health as well as some more stats. The Wondrous Destiny weapons are level 50, deal 66-96 damage, and grant some more stats. The Imbued Destiny weapons are level 60, deal 73-103 damage, and grant some more stats. The Penultimate Destiny weapons are level 70, deal 78-108 damage, and grant some more stats. The Ultimate Destiny weapons are level 85, deal 85-115 damage, and grant some more stats. One for Ash, which scales with his level. Also, it is temporary. The Doom Knight - as powerful as it is fearsome. The Necrotic Sword of Doom (the fourth Doom weapon), Doom Knight accessories, and finally the class armor are available now through a special deal for DragonLords. If you want to unlock the ultimate power of DOOM... be ready to shell out some cash. Doom isn't free, you know. There are four stages for this deal, and they all depend on how many months you've been a DragonLord. Each upgrade costs 19.95$, and there are four overall, which means 80$. BUT WAIT! If you have been a DragonLord for more than 24 months already, you can purchase the whole deal for 65$! Now that's a deal. BUT WAIT, THERE'S MORE! If you purchased the full-account DA upgrade, all four pieces of the Doom Knight equipment will unlock on each and every one of your characters! However, the 40,000 DCs will go only to the main character you're upgrading. Now that's quite a deal, eh? If you have been playing for six months, you can purchase the first stage for 19.95$, which gives you the Necrotic Sword of Doom with an amazing special attack, as well as 10,000 DragonCoins, and finally a special Doom Knight title on your character page! If you have been playing for twelve months, the second stage is available, again for 19.95$. This time you get the Doom Knight Helmet, 10,000 MORE DragonCoins, and the Superior Doom Knight title on your character page! If you have been playing for eighteen months, another 19.95$ will bump you up to the third stage, which gives you the Doom Knight Cloak, 10,000 MORE DragonCoins, and the Elite Doom Knight title on your character page! Finally, if you have been playing for twenty-four months, the final 19.95$ will give you access to the Doom Knight armor and all of its devastating, DOOM-y skills. On top of that, you get 10,000 MORE DragonCoins, and the final Master Doom Knight title on your character page! Now, a few details about the in-game benefits. The weapon and accessories will always stay relevant - as the level cap rises, so will new tiers be added to the Doom Knight items to accompany each new cap. The armor itself is quite powerful - you can get an idea on how to use it and read up about some strategies in revan 225's Doom Knight Advanced guide. In addition, all details about the Doom Knight armor skills can be found in the Encyclopedia entry. So what are you waiting for? Join the ranks today! Vaseline28, Suuichi, Martin13, sparkyfrazer, Paz Vi, 007 midget, AtiwH, Burn, Hopeful Guy, Anoril,bob.builder, Sasuke Uchiha1132, Axoris, Lord Xenaphos,SchwhatNow, doicare3, diva77677, Delicious, Danteistheman, Armakuny, Razmos, SamJJE101, TheChosen1, damon10371, SlyCooperFan1, Glerax, Boxer2380, thoan900, scifijimmy, Almighty Agathor, Mr G W, raghav_sharma, Peachii, 1997p3. Since I don't have an agent, I can't thank him. :( Thanks for reading!